An archive of the written dialect of Lancashire. For the finest resource of the literary output of Lancashire's poets and authors, we can do no more than recommend the website dedicated to the memory of Gerald Massey. As the welcoming remarks point out,(see below), the site also acknowledges 'comparable poets and authors of his era' and these include all the major Lancashire representatives of the period. Full texts are given and we, at the Society, are amazed and indebted to Ian Petticrew for his astonishing work in bringing these texts to our attention in this way. This web site is dedicated to the life and work of the Chartist, poet, author, and free thinker, Gerald Massey, and to comparable poets and authors of his era, a number of whom by their protests were to influence political and social reform in Victorian Britain. Most had working-class backgrounds. My aim is to resurrect their writing, much of which has for many decades been unavailable outside of national archives and university libraries, and to place it before a wider audience. 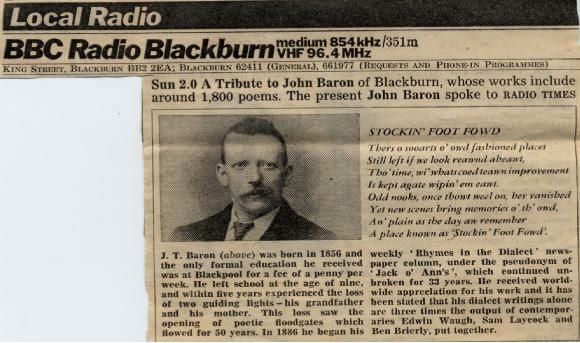 We present the poems of this fine Blackburn poet as a series of images as printed as a feature in the press . Known as 'Jack o'Ann's', Baron lived from 1856 to 1922 and in his lifetime produced three times the output of Waugh,Laycock and Brierly put together. Our archive has nearly 80 of his poems for you to enjoy, presented as 39 page pdf document. Its a large document so be patient in downloading and we recommend broadband for this. Click here and enjoy some really excellent dialect poetry on a wide variety of topics. We suggest you use a viewing programme where you can zoom in to see the print clearly. Here is an article printed in the Radio Times in recent times which attests to the reputation of John Baron. The poem quoted can be read in full in the pdf. As a guide we can issue booklists of the type of literary material available. These are listed below and just click on the members name to view the list. many other resources appear on our 'Links to' page.